LOS ANGELES, Calif. — Scary moments for a man driving in South L.A. when a sink hole swallows his pick up truck this morning. The driver managed to get out unharmed after he drove into the sink hole along the 9500 block of South Figueroa Street around 3:30 AM. The driver says he was driving home from work in El Segundo when suddenly he fell into the sink hole. 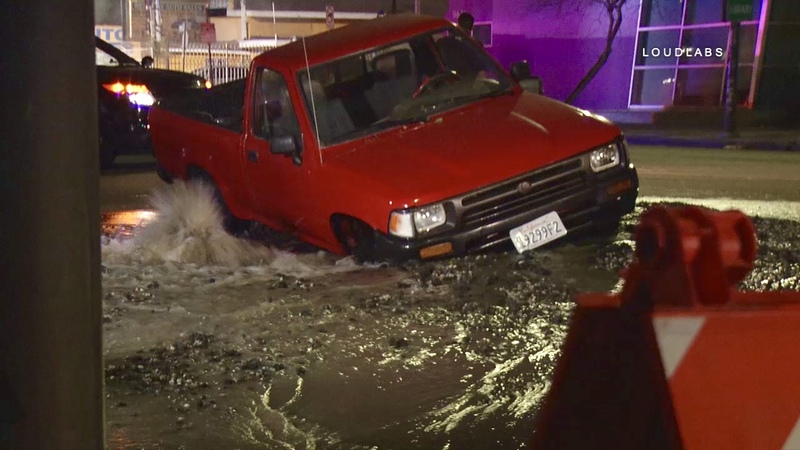 Video shows a red pick up truck partially into the sink hole with water gushing out of the ground. Police have shut down both sides of Figueroa between Colden Avenue and 96th Street.